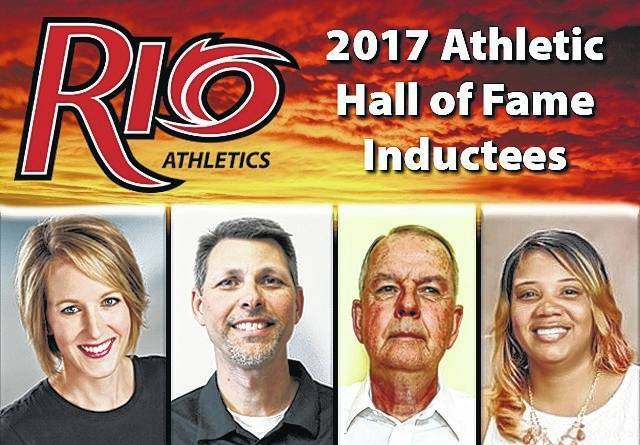 RIO GRANDE, Ohio — A former men’s basketball standout, a pair of women’s basketball greats and the school’s current athletic director headline the University of Rio Grande’s Athletic Hall of Fame Class for 2017. Don Trainer, Alkia Fountain (Page), Sarah Drabinski (Rase) and Jeff Lanham make up the group of honorees announced Thursday by school officials. The quartet will be formally inducted during the school’s annual Hall of Fame banquet on Saturday, Nov. 18, at 7 p.m., in the Davis University Center. The banquet follows the conclusion of the Bevo Francis Invitational Tournament, scheduled for Friday and Saturday, Nov. 17-18, at the Newt Oliver Arena. The Class of 2017 — and all Hall of Fame members in attendance — will be recognized prior to the tournament’s final game at approximately 4:30 p.m. on the 18th. The banquet begins with a 6:30 p.m. reception, with the formal program to follow at the top of the hour. Trainer starred for Rio men’s basketball program from 1963-67, scoring 1,314 points over the course of an 85-game career. He averaged 15.4 points per game for his career, while shooting 46 percent from the floor and 84 percent from the free throw line. During the 1964-65 campaign, Trainer finished fifth in the country by connecting on 90 percent of his free throw attempts. He hit 67 of final 69 free throw attempts that season and also scored a career-high 43 points in a game against West Liberty (WV) State. The Beaver, Ohio native — who currently resides in Bloomingburg, Ohio — went on to teach mathematics for 20 years and retired as the principal of Miami Trace High School in Washington Court House, Ohio. Trainer also served as both a high school and college basketball official for 15 years, working six regional and state tournaments. Fountain enjoyed an award-filled career while playing women’s basketball at Rio Grande from 2001-05 and finished her career as the program’s all-time leading rebounder (1,196). She also ranks 10th on the school’s all-time scoring list with 1,484 points. The Columbus, Ohio native averaged a “double-double” throughout the course of her playing career and is one of only three players in program history to finish with 1,000 or more points and 1,000 or more rebounds. Fountain was named to the America Mideast Conference All-Freshman Team in 2001-02 and was a first team All-AMC selection in each of her final three seasons. She was also named an honorable mention All-American by the NAIA and by Kodak/WBCA as a senior. Fountain currently lives in Canal Winchester, Ohio with her husband and two children and works as a Workforce Management Planning Analyst for Alliance Data. Drabinski began her Rio career as Fountain’s was coming to a close and earned America Mideast Conference Freshman of the Year honors in 2005-06. By the time the Stow, Ohio native completed her collegiate career, she finished with 1,374 points (15th on the school’s all-time scoring list) and 914 rebounds (third on Rio’s all-time list). Drabinski was a two-time All-AMC second team honoree and was twice named to the All-AMC South Division team. As a senior, she also was named an honorable mention Kodak/WBCA All-American and was Rio Grande’s Female Athlete of the Year. Drabinski, who currently resides in South Point, Ohio, is married to former URG men’s basketball standout P.J. Rase and works as a registered nurse at Cabell Huntington Hospital in Huntington, W.Va.
Lanham, the son of former Rio Grande coach/athletic director Art Lanham, was an assistant men’s basketball coach at Rio for 10 seasons before becoming the school’s Director of Athletics in January 2003. Lanham, who received both a bachelor’s degree and a master’s degree from Union (KY) College, is a board member of the NAIA Athletic Director’s Association, the Vice Chair of the River States Conference Administrative Council and the RSC’s Athletic Director liaison for men’s soccer. A resident of Rio Grande, Lanham was named the Kentucky Intercollegiate Athletic Conference Athletic Director of the Year in 2014-15. During his tenure at Rio Grande, the school’s athletic programs have produced 24 regular season conference championships, 12 conference tournament titles, two team national championships, one individual national champion, two national runner-up teams, 64 All-Americans and 168 NAIA-Daktronics Scholar-Athletes. In addition to overseeing various on-campus field/stadium construction and/or renovation projects, Lanham has also had a role in creating the women’s soccer, women’s golf and men’s/women’s bowling programs. He also spearheaded the revival of the school’s men’s golf program this fall. Tickets for the banquet, which are $15 each, can be purchased through the Alumni Relations office at 740-245-7431. Nomination forms for alumni awards, Athletic Hall of Fame and Educators Hall of Fame are available through the resources link at rio.edu/alumni on the Alumni Relations webpage. Nominations are due by Feb. 1 of each year. Email alumni@rio.edu for more information or questions. The 2017 University of Rio Grande Athletic Hall of Fame inductees include, from left, Sarah Drabinski (Rase), Jeff Lanham, Don Trainer and Alkia Fountain (Page).